Sony and Panasonic were downgraded Thursday by Fitch. Fitch Ratings downgraded Sony and Panasonic debt to junk status Thursday and said the ailing Japan-based consumer electronic makers both needed radical restructuring to improve their prospects. Panasonic's rating was cut to BB from BBB-, while Sony was moved to BB- from BBB-, with a negative outlook. Both companies now carry speculative, or junk, ratings. The downgrades are the latest in a string for Sony and Panasonic, which have been haemorrhaging money and struggling to find positive momentum. 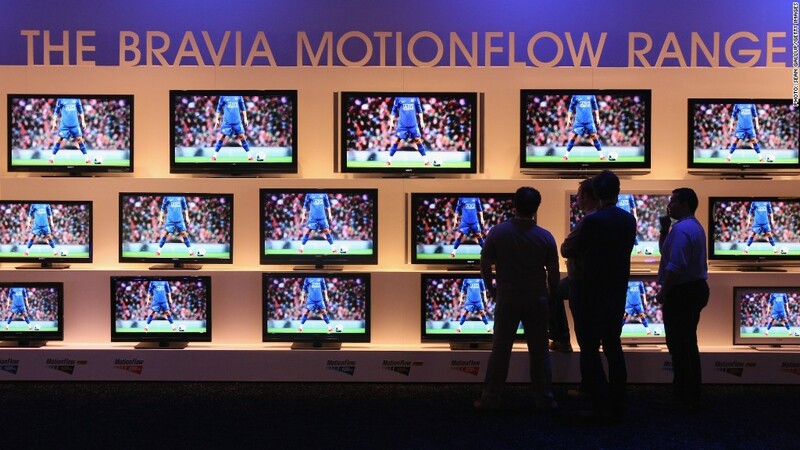 The companies, once the crown jewels of the high-tech Japanese economy, have been hit in recent years by a strong yen and weak demand for televisions. Sony now has a market cap of just more than $10 billion, and hasn't turned a profit in four years. Its shares are trading near their lowest levels in three decades, and even closed below the 800 yen mark in Tokyo earlier this month. "We think there is little headroom for Sony," Fitch's Steve Durose said in a statement. "Without a radical change to the structure of their businesses it is difficult to see profitability improving enough for [Sony and Panasonic] to regain investment-grade ratings," Durose said. Panasonic seems to be in better shape than Sony, and less dependent on its struggling core electronics business. Sony is the subject of frequent speculation as a possible takeover target, with cash-rich competitors like Apple, Google and Microsoft all reported as possible suitors. Related: Can Sony be saved? Sony made a play of its own in recent months, taking a stake in Olympus, the scandal-plagued company embroiled in an epic accounting fraud. But analysts remain skeptical that Sony will be able to achieve a long-term turnaround. "The future of both companies will depend on their ability to curb loss-making segments and rediscover the kind of technological leadership which historically enabled them to develop must-have products," Durose said.